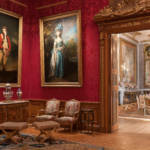 The treasure-filled Smoking Room at Waddesdon Manor contains vivid Renaissance works in glass. A pair of gold-ruby glass candlesticks is currently shown in the Riches of the Earth display, where they can be studied close-up. The 17th-century writer Christopher Merrett described glass as “one of the true fruits of fire”. Merrett (1614-1695) was translating Antonio Neri’s 1612 book, ‘The Art of Glass’, which was the first to reveal a glassmaker’s secrets. Looking at the fragile early printed text (only entrusted to the careful reader who signs for it in the V&A) makes you appreciate how important glass was as a material. Glass is made with silica (found in sand). The silica is mixed with other materials and transfigured by fire, to become a molten mixture that is then quickly cooled. However, Merrett and his contemporaries found it hard to classify. Sometimes molten glass was described as a metal. In fact, some said it was better than metal because it was transparent. When purified in fire, it could be the equal of gold. Merrett described it as a substance jointly fashioned by nature and art. Meanwhile, Haudicquer de Blancourt (1650?-1704), both a genealogist and the author of a book on glass, presented an apocalyptic vision where the heat at the end of the world would vitrify creation, and turn everything to glass. Gold-ruby glass isn’t just a name. 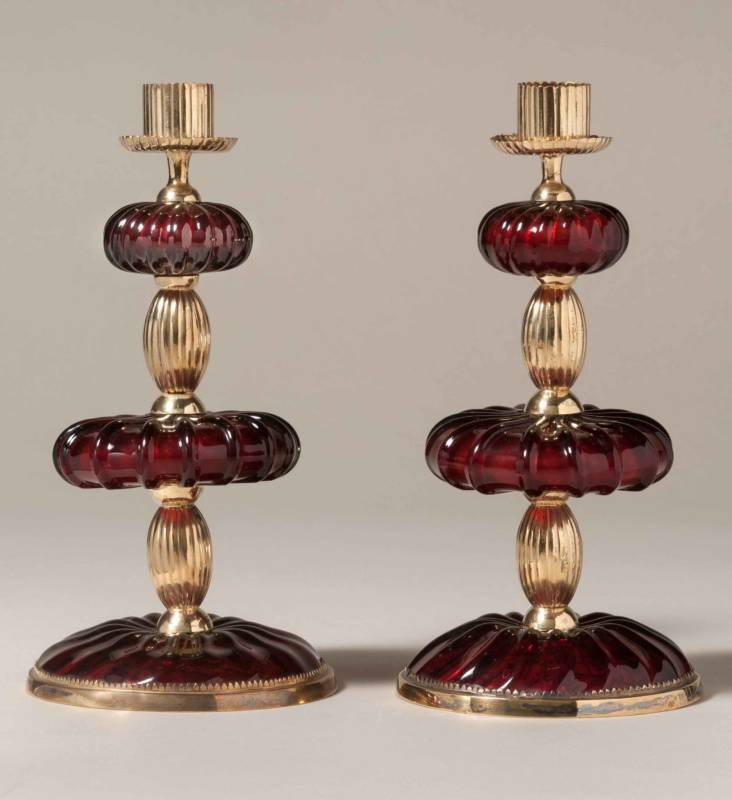 The distinctive ruby red of these candlesticks was actually created using gold. Nowadays, alchemy – the transformation of base metals into gold – is seen as the preserve of the deluded dreamers or charlatans of the past. But in the Renaissance it could be a serious business, and alchemists revolutionised glassmaking with their chemical knowledge gleaned through experiments. Unknown, Ruby glass candlesticks, 1675-1700; Waddesdon (National Trust); acc. no. 2934.1-2. 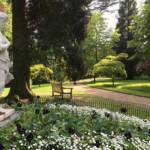 Photo: Mike Fear © National Trust, Waddesdon Manor. Johann Rudolf Glauber (1604-1670), an alchemist (and self-publicist), was among the first to figure out how gold could be used to create deep red glass, and another alchemist Johann Kunckel (1637?–1703), the son of a glassmaker, successfully put his ideas into practice at the court of the Great Elector in Brandenburg. He actually came to the Elector’s attention by unmasking a trickster who claimed to be able to turn silver into gold. Creating the ruby-glass objects needed both chemical knowledge and practical glassblowing expertise, as the transformation took place in the fire. When gold chloride was heated with tin chloride in aqua regia (royal water), gold nanoparticles would form, which made the object look deep ruby red. It was all about how these particles reflected the light – if they were too small, the glass would just look clear. If they were too big, it would look dark brown. 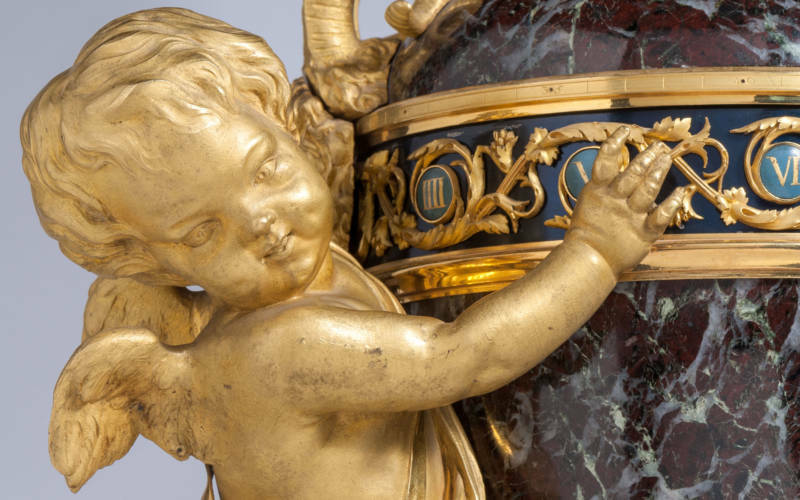 You might say, as Glauber did, that this was alchemy in action: just a little gold in a mixture could produce a piece of glass whose colour was so rare that – for a while – it was as precious as gold. By Michaela Daborn, Curatorial Intern 2015.